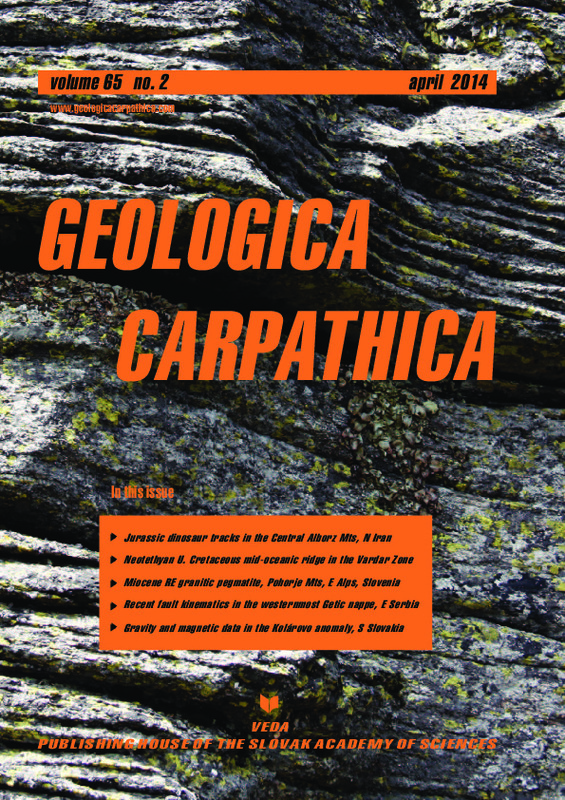 The Upper Cretaceous ophiolite of North Kozara – remnants of an anomalous mid-ocean ridge segment of the Neotethys? Abstract: The Shemshak Group includes alternating layers of coal-bearing shale and siliciclastic sediments in the Baladeh area in the central Alborz Mountains of northern Iran. A diverse and abundant Jurassic dinosaur footprint assemblage is now recognized in the group, which is Toarcian to Bajocian in age in the northern Baladeh. This is the first report of a diverse dinosaur ichnoassemblage from Iran that includes the footprints of sauropods. These tracks can be assigned to three groups of trackmakers: theropods, ornithopods and sauropods. Those of theropods are typically tridactyl in shape, their trackways reflecting bipedal movement. Theropod footprints are very abundant in both northern and western Baladeh. The studied theropod tracks themselves are divided into three major dimensional groups. The medium sized footprints (footprint length, 11—15 cm) are abundant and have a stride length, digit and pace angles like the coelurosaurs footprints and trackway. Theropod footprints were identified as similar to Schizograllator otariensis, Talmontopus tersi and Wildeichnus isp. Ornithopod footprints are tridactyl with rounded and thick toes and belong to bipeds. Some didactyl imprints were also observed. Skin imprints were well preserved in these footprints. The ornithopod tracks resemble Jiayinosorupus johnsoni, as well as Velociraptorichnus sichuanensis for didactyl footprints. Sauropod footprints found in the western part of Baladeh are assigned here to Eosauropus isp., which are pentadactyl pes imprints of a quadruped. The assemblage from Iran resembles similar associations from eastern Asia. Abstract: This study sheds new light on the origin and evolution of the north Kozara ophiolite, a part of the Sava-Vardar Zone. The Sava-Vardar Zone is regarded as a relict of the youngest Tethyan realm in the present-day Balkan Peninsula. The north Kozara ophiolite consists of a bimodal igneous association comprising isotropic to layered gabbros, diabase dykes and basaltic pillow lavas (basic suite), as well as relicts of predominantly rhyodacite lava flows and analogous shallow intrusions (acid suite). The rocks of the basic suite show relatively flat to moderately light-REE enriched patterns with no or weak negative Eu-anomaly, whereas those of the acid suite exhibit steeper patterns and have distinctively more pronounced Eu- and Sr- negative anomalies. Compared to the known intra-ophiolitic granitoids from the Eastern Vardar Zone, the acid suite rocks are most similar to those considered to be oceanic plagiogranites. The new geochemical data suggest that the basic suite rocks are similar to enriched mid-ocean ridge basalts. The geochemical characteristics of the acid suite rocks indicate that their primary magmas most probably originated via partial melting of gabbros from the lower oceanic crust. Our study confirms the oceanic nature of the north Kozara Mts rock assemblage, and suggests that it may have formed within an anomalous ridge setting similar to present-day Iceland. Abstract: The granitic pegmatite dike intruded the Cretaceous UHP rocks at Visole, near Slovenska Bistrica, in the Pohorje Mountains (Slovenia). The rock consists mainly of K-feldspar, albite and quartz, subordinate muscovite and biotite, while the accessory minerals include spessartine-almandine, zircon, ferrocolumbite, fluorapatite, monazite- (Ce), uraninite, and magnetite. Compositions of garnet (Sps48—49Alm45—46Grs+And3—4Prp1.5—2), metamict zircon with 3.5 to 7.8 wt. % HfO2 [atom. 100Hf/(Hf + Zr) = 3.3—7.7] and ferrocolumbite [atom. Mn/(Mn + Fe) = 0.27—0.43, Ta/(Ta + Nb) = 0.03—0.46] indicate a relatively low to medium degree of magmatic fractionation, characteristic of the muscovite – rare-element class or beryl-columbite subtype of the rare-element class pegmatites. Monazite-(Ce) re- veals elevated Th and U contents ( ≤ 11 wt. % ThO2, ≤ 5 wt. % UO2). The monazite—garnet geothermometer shows a possible precipitation temperature of ~ 495 ± 30 °C at P ~ 4 to 5 kbar. Chemical U-Th-Pb dating of the monazite yielded a Miocene age (17.2 ± 1.8 Ma), whereas uraninite gave a younger ( ~ 14 Ma) age. These ages are comtemporaneous with the main crystallization and emplacement of the Pohorje pluton and adjacent volcanic rocks (20 to 15 Ma), providing the first documented evidence of Neogene granitic pegmatites in the Eastern Alps. Consequently, the Visole pegmatite belongs to the youngest rare-element granitic pegmatite populations in Europe, together with the Paleogene pegmatite occurrences along the Periadriatic (Insubric) Fault System in the Alps and in the Rhodope Massif, as well as the Late Miocene to Pliocene pegmatites in the Tuscany magmatic province (mainly on the Island of Elba). Abstract: In this study we performed a calculation of the tectonic stress tensor based on fault slip data and all available focal mechanisms in order to determine the principal stress axes and the recent tectonic regime of the westernmost unit of the Getic nappe system (Gornjak-Ravanica Zone, Eastern Serbia). The study is based on a combined dataset involv- ing paleostress analyses, the inversion of focal mechanisms and remote sensing. The results show dominant strike-slip kinematics with the maximal compression axis oriented NNE—SSW. This is compatible with a combined northward motion and counterclockwise rotation of the Adria plate as the controlling factor. However, the local stress field is also shown to be of great importance and is superimposed on the far-field stress. We managed to distinguish three areas with distinct seismic activity. The northern part of the research area is characterized by transtensional tectonics, possibly under the influence of the extension in the areas situated more to the northeast. The central and seismically most active part is dominated by strike-slip tectonics whereas the southern area is slightly transpressional, possibly under the influ- ence of the rigid Moesian Platform situated to the east of the research area. The dominant active fault systems are oriented N—S (to NE—SW) and NW—SE and they occur as structures of either regional or local significance. Regional structures are active in the northern and central part of the study area, while the active fault systems in the southern part are marked as locally important. This study suggests that seismicity of this area is controlled by the release of accumu- lated stress at local accommodation zones which are favourably oriented in respect to the active regional stress field. Abstract: We present a new interpretation of the Kolárovo gravity and magnetic anomalies in the Danube Basin based on an inversion methodology that comprises the following numerical procedures: removal of regional trend, depth-wise separation of signal of sources, approximation of multiple sources by 3D line segments, non-linear inversion based on local corrections resulting in found sources specified as 3D star-convex homogenous bodies and/or 3D contrasting structural contact surfaces. This inversion methodology produces several admissible solutions from the viewpoint of potential field data. These solutions are then studied in terms of their feasibility taking into consideration all available tectono-geological information. By this inversion methodology we interpret here the Kolárovo gravity and magnetic anomalies jointly. Our inversion generates several admissible solutions in terms of the shape, size and location of a basic intrusion into the upper crust, or the shape and depth of the upper/lower crust interface, or an intrusion into the crystalline crust above a rise of the mafic lower crust. Our intrusive bodies lie at depths between 5 and 12 km. Our lower crust elevation rises to 12 km with and 8 km without the accompanying intrusion into the upper crust, respectively. Our solutions are in reasonable agreement with various previous interpretations of the Kolárovo anomaly, but yield a better and more realistic geometrical resolution for the source bodies. These admissible solutions are next discussed in the context of geological and tectonic considerations, mainly in relation to the fault systems.